As new farming techniques take hold, fresh Southern oysters are poised to gain a major following throughout the United States. Oyster farming in the South, from Virginia to the tip of Florida, is experiencing a rebirth. Hatcheries and aquatic farms are popping up along coastlines, cages nestled in the marshlands drawing benefit from the ebb and flow of the tides. Often praised for being one of the most truly sustainable seafood industries, oyster farming promotes a healthy ecosystem, as oysters filter pollutants and their reefs provide habitats for other types of marine life. State legislators have recognized the potential of this industry, with a good portion of the Southern states taking measures to encourage production. 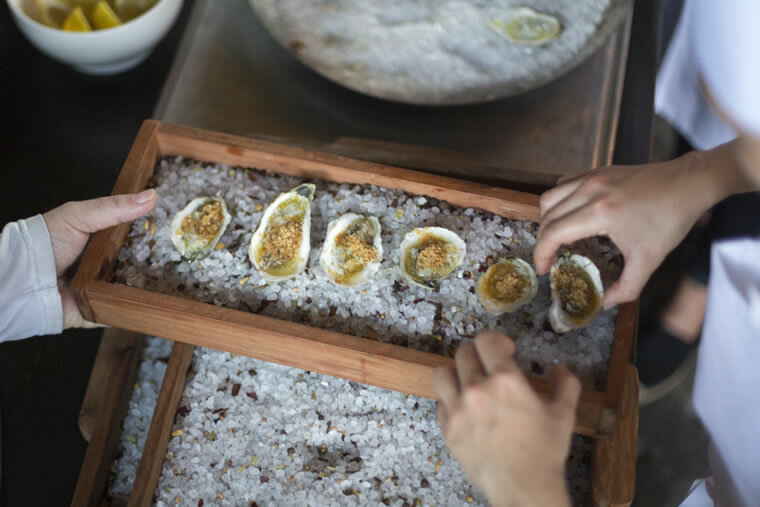 With restaurants eager to add delicious, sustainable sea-to-table products to their menus, Southern oysters are poised to gain a major following around the country. From the earliest days of our country’s human history, oysters have been eaten and enjoyed. Archeologists have unearthed massive shell middens, piles of discarded oyster refuse left by Native American populations thousands of years ago along the coast. The oyster was an important part of their diet, and some shared their appreciation for the bivalves with the settlers who came to the area. The first oyster roasts may have been used as a way to get stubborn shells to pop open when confronted with the heat, but whatever the reason, many of the indigenous populations certainly cooked their oysters. In the South, the tradition held as colonists began to host outdoor events serving the popular bivalve. 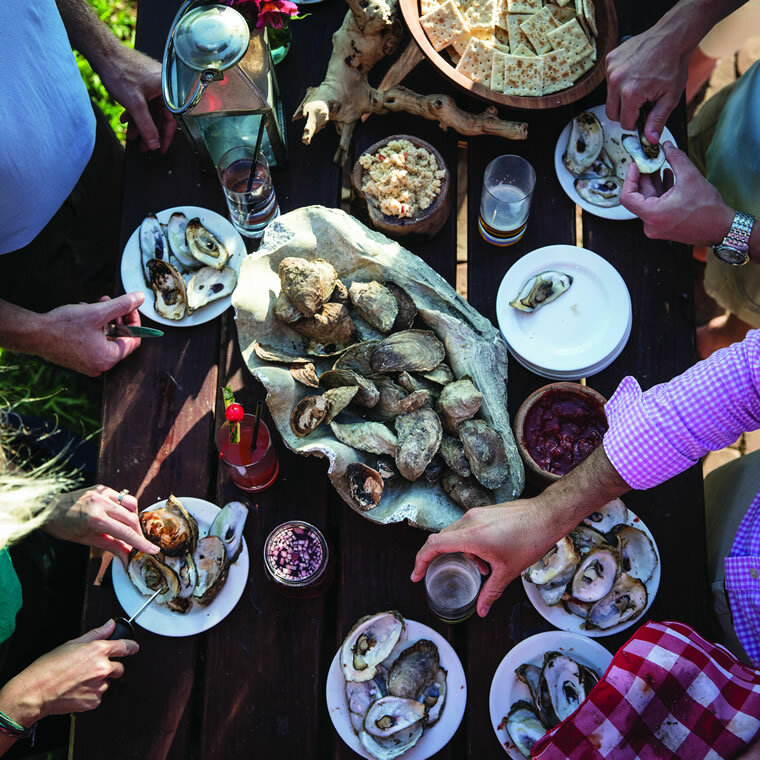 Maybe it’s the connection with the sea or just the abundance of oysters in tidal waters, but the oyster roast has become sewn into the culture of the coastal South as a way to celebrate nearly every type of event. Today, roasts are relaxed alternatives to more formal seated dinners. They seem to encourage laughter, conversation and bonding over the struggle with oyster knives and protective gloves in order to enjoy the fresh mollusks. There is nothing a Southerner loves more than to teach a newbie their preferred method of prying a stubborn shell open to reveal the perfect oyster. There is an easy camaraderie at an oyster roast that quickly turns strangers into friends, and the smell of the fire and beauty of the South’s outdoor environment only enhance the experience. At Sea Island, Executive Chef Paul Newman looks forward to the Rainbow Island Supper oyster roast, citing a longtime tradition. “Whenever we do this at the holidays, you see the families when they come in and you can tell this is a tradition,” he says. “The grandparents did it as kids, everybody in the family has been there since they were young. Seeing that and knowing how much fun it is for them is the highlight for me.” Although many other low-country dishes are served buffet-style at the event, the oyster roast is the main focus. Yet oysters’ popularity in the region extends far beyond these events. Southerners have sung about oysters, written about them and incorporated them in holiday meals. They prepare them on the half shell with bacon and spinach, poach them in cream, fry them in oil or simply slurp them out of a cracked shell. With oysters dating so far back into culinary history and being such an integral part of Southern culture, it is surprising that they have not been strongly represented in current commercial harvest. The reason is largely due to their configuration: Wild oysters in Southern waters grow in clusters rather than the preferred easy-to-shuck singles that restaurants love to serve on the half shell. Now, Southern farmers are trying to change that through scientific growing methods designed to reboot the Southern oyster. Fisheries in the South developed a burgeoning oyster industry from the late 1800s to post-World War II time period—in fact, in the early 1900s, Georgia led the nation in oyster production. However, the industry died out due to over-harvesting and decreasing demand. Now, the regulatory agencies that oversee the coast are determined to learn lessons from history as the South rebuilds its oyster industry. Farming equipment is used successfully in Virginia; for example, cages serve to protect vulnerable baby oysters from predators. This type of gear can be expensive, but the investment generally pays off in a product that is suitable for fine restaurant use. The oyster industry in Virginia was worth $196,125 in 2004; by 2014, it was worth $27.96 million, and it continues to grow. However, great care is taken to thoroughly vet any method that could affect estuaries and other marine environments, and the necessary research can prove time-consuming. In Georgia, the University of Georgia Marine Extension and Georgia Sea Grant are assisting the Department of Natural Resources’ Coastal Resources Division as it examines its regulations on Georgia’s oyster production methods. “The hatchery is established and we are working out all the kinks for the product,” says Thomas Bliss, director of the UGA Shellfish Research Lab, which launched the state’s first oyster hatchery in 2015. “Our focus is continuing to do research to find the best farming methods and preparing to be ready to train growers in those methods, once approved. We are conducting the research to provide the Coastal Resources Division with the information they need to make decisions.” The UGA oyster hatchery aims to provide oyster seed to establish an aquaculture industry in Georgia for single oysters that can be served on the half shell. Sapelo Sea Farms in Georgia already has a thriving clam farming business. Owner Charlie Phillips looks forward to the day when state regulations support oyster farming but, in the meantime, Sapelo harvests the wild oysters in the Sapelo Sound area. He and his crew pull clusters out of well-known beds, most of which go to fish markets. Harvesting these wild oysters is beneficial for the bed. “The way we work the area is much better for oyster banks than to not work them at all,” he explains. For every 10 bushels of picked oysters, pickers are required to put back cultch, material that oyster larvae can use for settlement; taking the top growing oysters and then spreading material in a bigger space helps the oyster mound grow. 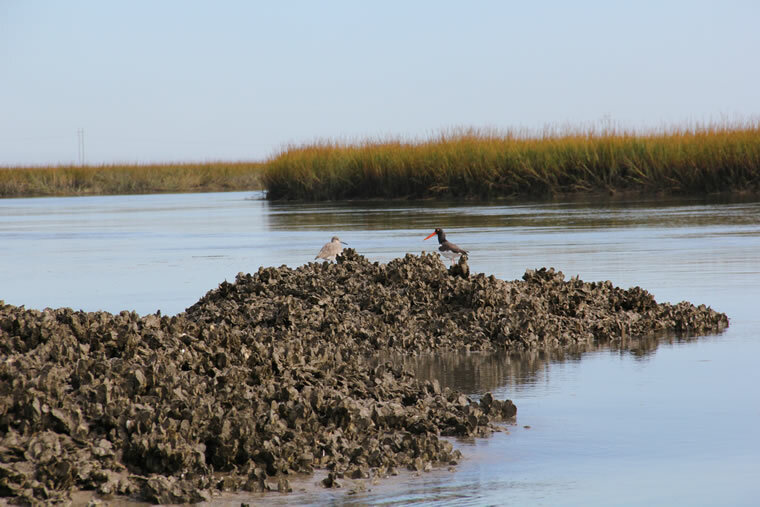 The coastal wetlands found in the Southern United States are steeped in mineral-rich tidal waters, and the significant salinity and unique water properties give the shellfish harvested from each region their own particular taste. The plump oysters that rest in a salty liquor with a sweet finish are reflective of the green and verdant marshes where they developed. However, today, consumers are not just concerned with taste, they are looking for options that bring value with their harvesting—and oysters are truly beneficial to the environment where they live. Food production often depletes the surrounding environment rather than helping it. With oysters, that isn’t the case. As filter feeders, oysters do not require any type of special food. They improve water quality—one oyster can filter up to 50 gallons of water in 24 hours—and by filtering sediment, they allow more sunlight to reach underwater plants. Their reefs also provide habitats for other marine animals, prevent erosion and fortify wetlands by acting as a protective barrier. Executive Chef Jon Schwenk, co-owner of Georgia’s C&S Seafood and Oyster Bar, Hugo’s Oyster Bar and C&S Chowder House, knows his seafood. He grew up in Montauk, New York, a short bike ride away from both the bay and the Atlantic Ocean, which fostered an appreciation for quality seafood at an early age. When he partnered at C&S in Atlanta with his friend Rich Clark, there was a lack of variety in the area when it came to fresh, gourmet oysters. Restaurants did serve oysters, but diners lacked exposure to differences in taste. C&S filled this need, offering six to 10 selected oysters, sourced from Virginia up the coast and as far north as Canada. As the demand for fresh, flavorful and sustainably harvested oysters increases, the fisheries in the southeast will continue to develop their methods for harvest. The first forays into the market have been so successful that the other states are likely to soon follow suit. Restaurants in the South are looking forward to serving more of their own local, artisanal options, just as diners are looking forward to enjoying them. The Rainbow Island Supper at Sea Island is a decadent Southern feast with an oyster roast as its centerpiece. Accompanying dishes can include everything from fried chicken, fresh local shrimp and Brunswick stew to cold coleslaw. Depending on the time of year, 100 to 500 guests attend the supper, enjoying bluegrass music in the beautiful location. 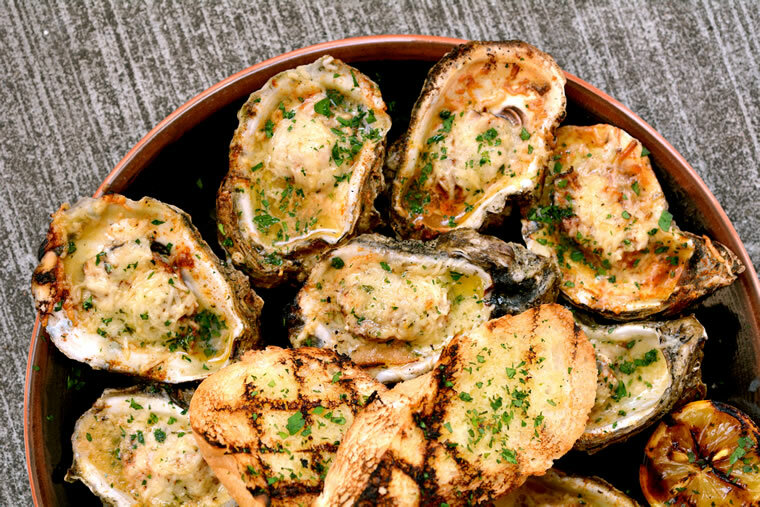 The oysters are prepared in true Southern style: An open fire is stoked in a 4-foot pit, then the oysters are poured over a steel grate and wet burlap bags are thrown over the top to create the steam that causes them to open. When they come off the fire, they are cracked before they reach the guests, served steaming on the half shell. The only effort required is choosing the accompaniment—mignonette, cocktail sauce, horseradish, hot sauce or a squeeze of fresh lemon.